Theatre Review: Everyman – National Theatre, London | Shut Up Hamish! Sometimes you’re drawn towards a piece of art because of it’s themes. Perhaps the topic of the artwork speaks to something that’s been on your mind at that point. Art, after all, is not just escapism but a way to learn about the world from different perspective. Or it is a medium of conversation, to discuss themes and transmit ideas in a way that would not be possible through everyday conversation. I felt drawn to the National Theatre’s staging of Everyman, not just because stars Chiwrtel Ejiofor of 12 Years a Slave fame – although I admit that was a part – but also because of the literalization of the theme of man’s confrontation with Death. With Everyman being based on a 15th century morality tale, it felt almost like Ingmar Bergman’s The Seventh Seal brought to the stage, yet subverting religious themes within the original text to become a modern criticism of the vacant materialism of modern lives. The subject of death is a fun one to ruminate on, and although it might sound heady, a contemporary update of a church morality tale is something worth venturing out to see. In this version, Death arrives to interrupt the Everyman at the height of his success, just as Death came to the plague-era knight in The Seventh Seal. 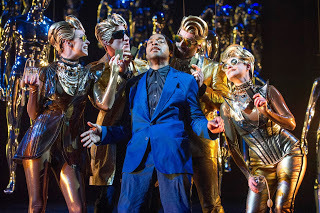 Chiwrtel Ejiofor’s Everyman character is not so cunning as Max Von Sydon’s Knight however, and is a much more of a jaded, pleasure seeking, ambitious modern man. The figure of Death here is portrayed as a wisecracking working class salesman, a subversion of the expected stereotype. Our narrator likewise is a figure taking the place of God, who here is cast as a cleaning lady with a wise mind. The Everyman, having not had time for his family for years, and surrounding himself with shallow friendships based on wealth and decadence – now finds himself with no one to testify in support of his character, in the face of death. These universal themes are boldly presented by writer Carol Anne Duffy and director Rufus Norris, who have pieced together a strong cast, backed up with original visual and aural cues. Spectacle is there right from the first act – such as Ejiofor descending from the roof on wire, simulating perhaps his suicide. A video wall is then used to enhance settings – and a hurricane, metaphor for man’s uncaring attitude to his earth, is simulated midway through. These tricks are impressive but not distracting. The acting and polish of the script is what shines through, with traditional dialogue sitting side by side with modern colloquialisms. Other notable strong performances include the Everyman’s parents, both of declining health, with a family dynamic many will able to relate to – with one sibling doing most of the caregiving while the other pursues more selfish ambitions. Ejiofor largely steals the show however, with a hugely expressive performance loud enough to reach to the back of the theatre, yet nuanced enough to effectively carry the emotion of the story. It all builds towards a touching climax, where man comes face to face with his child self. I felt the director, writer and actors hit allusive grace note with the execution of the ending. We all have days where we sit around and ponder what could have been. Or other days where we hear the news and think of the destruction man is causing and whether the world is truely being affected by this. The play takes these emotions and deals with them in a way that is not forced, but instead sublimely executed. 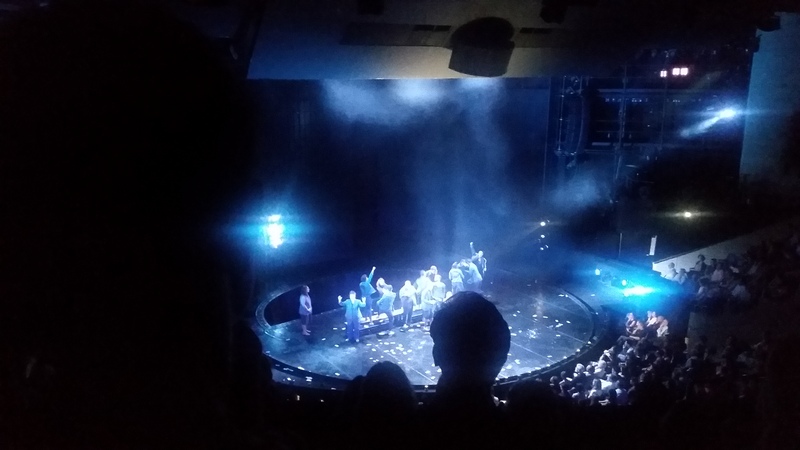 As my first time in the National Theatre and my first time seeing a major contemporary theatre piece in a British Theatre, I was perhaps always going to be impressed. Especially a performance which featured a major international actor who only recently was nominated for an Oscar for one of my favourite films of the last few years. But I will say I’ll just say – if in the mood for contemplating mortality, I suggest you head along to the National Theatre before 30th August.